You can have straight teeth without the traditional metal braces with Invisalign® orthodontic treatment! 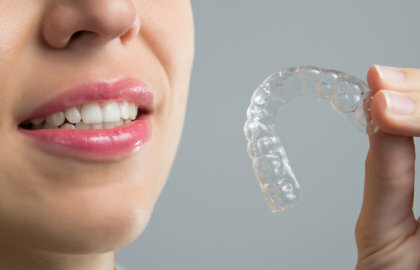 Invisalign® uses a series of clear plastic aligners to straighten and reposition crooked teeth. The aligners are virtually invisible, so you can wear them with confidence without feeling self-conscious. Invisalign® aligners are made using a combination of special impressions (molds) using state-of-the-art computerized 3-D imaging technology patented by the Invisalign®. The length of treatment varies from patient to patient. Results are often achieved in one year. If you want to know if Invisalign® is right is for you, schedule an appointment at a Smile Clinic today. In addition to Invisalign®, our orthodontists offer a full array of comprehensive adult orthodontic services, including conventional treatment with braces when it is necessary.